I hate this culture of pointing out the really obvious to people just to cover your back. It is getting worse and worse. At work we got a sticker on the coffee urn telling us hot water is hot. If they were less pc and just stuck a sticker on it saying 'Don't sue us if you are stupid enough to burn yourselves', I'd respect them more! But today's took the biscuit... 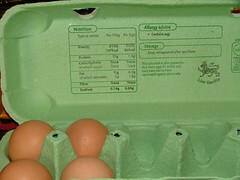 I found this allergy advice inside a box of free range eggs I was using to make scrambled egg rolls for lunch.